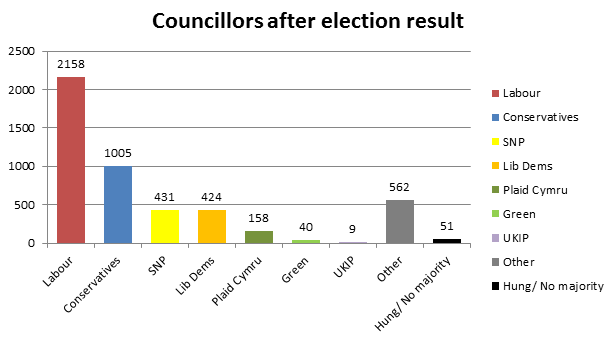 It was the typical mid-term blues for the Conservatives and Liberal Democrats, with Labour clutching at the opportunity to gain many Councils and Councillors. The last month has been a terrible time for the Tories, with scandals and economic doubt, making the election perfect timing for maximum casualties. And, indeed, it seemed inevitable that, despite the reservations over Labour’s doubted leader, his party would make gains. 38% of people voted for Labour, compared to 31% for the Conservatives and the Lib Dem’s 16%. UKIP’s share of the vote has risen to 13% where they stood, giving them their best local election night in history. All of this marks the typical loss of a Government in the middle of its term in power, with this particular impact exacerbated by the double-dip recession, the BskyB-Hunt scandal and the Tory Treasurer scandal. Predictably, Ed Miliband declared that his party is “winning back people’s trust,” stating that the election results gave a “wake-up call” for the Coalition to change course in its economic strategy. However, many argue that this is simply not the case: a Labour win was virtually certain in the current context, and Miliband still has a long way to convince voters for a General Election victory that would mean he would be Cameron’s successor. Indeed, Ed Miliband seems all too ready to conveniently forget that it is largely due to his party’s short-sighted spending that the Government has to cut so much. I am also going to take this chance to pay a fitting tribute to many councillors that have lost their seats yesterday. It is a bitter reality that pioneers for local development will suffer due to national dissatisfaction, and, unfortunately, many of these councillors that have been great for their local area have lost because of the national picture. In the capital, Boris Johnson has won the political position with the highest personal mandate of the country: the Mayor of London. Despite national low support for the Conservatives, Boris’ popularity, fuelled by his eccentric charisma, helped him beat Livingstone by 3%, in far closer contest than expected that was won on second preference votes. The other election related to mayors was, of course, the referendum. The public seems to have given a resounding ‘NO’ to the idea of “a Boris in every city” (Cameron), with nine out of the ten cities voting ‘No’. However, Bristol did vote ‘Yes’ and Doncaster voted to keep its mayor. Many say that the referendum should never have been: that if the correct consultation had been applied, then there would have been a realisation of the unpopularity of the concept and therefore no need to waste more taxpayer’s money. It seems that most people think that another layer of bureaucracy is needless, despite the potential advantages of local accountability, representation and responsibility. Overall, fewer than one in three of those with a vote bothered to use it. Many factors could be the cause of this: the bad weather; dissatisfaction and detachment with Westminster politics; a lack of interest in political issues. One thing is, however, certain: although the party did make massive gains, Labour cannot claim the support and backing that it is doing. The timing, context and turnout of this election refuse Ed Miliband this privilege.